Abuela Grillo is an animated short directed by Denis Chapon and featuring the voice of Luzmila Carpio. It is, perhaps, the most moving 12 minutes of moving picture I have seen lately. It *is* Bolivia and it is more than that. It is about water, globalization, corruption, and conservation. In the film, Abuela Grillo (Grandmother Cricket, from a lowland myth; a stand-in for Pachamama) is driven from the lowlands. She makes her way up the east side of the Andes, stopping to greet llamas and to drink juice from a street stall, and arrives in La Paz. The rest is for you to watch. We can talk politics via email. The imagery in Abuela Grillo is evocative and nostalgic. 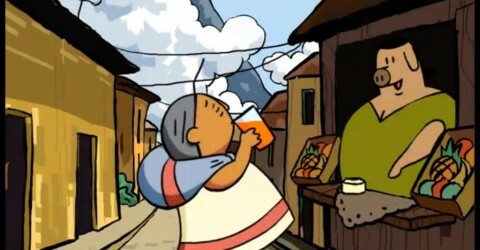 The animators capture the essence of La Paz by choosing small bits of familiarity. Also big bits: as Abuela Grillo approaches La Paz, the Altiplano gives way and she almost dips into the bowl that the city is in. This is how everyone enters La Paz. It is an experience you never forget. It is impossible to take a photo of it. The singing is in Quechua but the emphasis isn’t on words. You can watch this with your children. Enjoy.